JAKARTA, 15 APRIL 2019 – With over 17,500 islands covering 1.905 million square kilometers, the vast Indonesian archipelago is often known for being a logistical nightmare. The need to solve this problem, coupled with the growth of e-commerce platforms zeroing in on the Indonesian consumer market, has built a logistics market whose revenue is expected to reach US$240 billion by 2021. Waresix, an end-to-end logistics tech startup, has major ambitions to improve the supply chain and provide logistics solutions for individuals and businesses looking to tap into the consumer market in a more efficient manner. The company has created a curated platform that connects them to warehouse operators, as well as ground and maritime transport providers that are ready to rent out their spaces. As of today, Waresix has covered both major cities and remote areas across Indonesia to handle general cargo, retail fulfillment, cold storage, transportation, and cross-border warehousing services for overseas clients. Such a service is invaluable to businesses in the archipelago, which has unique logistical challenges. Aside from the country being made up of islands, weak transport infrastructure and the lack of economic development prevents many businesses from making significant progress at a faster pace. Unlike the United States or China, where trucks alone are adequate to cover most of the nation’s vast land area, and major developments enable better infrastructure and transport links, Indonesia is still figuring out how to overcome the hurdles that the landscape presents. Needing to conquer both land and sea just to transport something as small as an apple from one city to another is the biggest hurdle of them all. Multiple inherent problems prevent the nation from having a seamless logistics process, including infrastructure and maritime connectivity. In addition, the total cost of logistics in Indonesia is high – in 2016, logistics made up 24 percent of Indonesia’s gross domestic product. The World Bank data in 2016 revealed that Indonesia’s logistics performance is 63rd out of 160 countries. Although the country is in the top 10 performers for lower-middle income countries, Indonesia is ranked lower than other ASEAN countries like Vietnam, Malaysia, and Singapore. Thus, a multi-modal approach is needed to transport the goods – combining different types of transport methods to reach remote, inter-island areas. However, the arduous and costly process constantly gives businesses nightmares as they need to deal with multiple vendors to tackle each area, for every single route shipment. Many players attempt to reduce logistics costs by providing a solution for a small chunk of area. However, none of them give customers a truly holistic solution. “Logistic in Indonesia has been misunderstood by many if you look at it outside-in. Indonesia is not one big piece of homogenous land, unlike India or China, hence it is a hyperlocal- fragmented-multimodal transport play,” explains Willson Cuaca, managing partner at venture capital firm East Ventures, who seeded Waresix. He continues, “Waresix team is on the right track to optimize and bring efficiency to the logistics industry. Waresix positions itself as a one-of-a-kind provider of a more holistic approach to logistics. It provides a curated platform that is best fit and most efficient for each customer category. Logistics involve a wide range of elements, including transport infrastructure, cargo, consolidation, warehousing, and more. 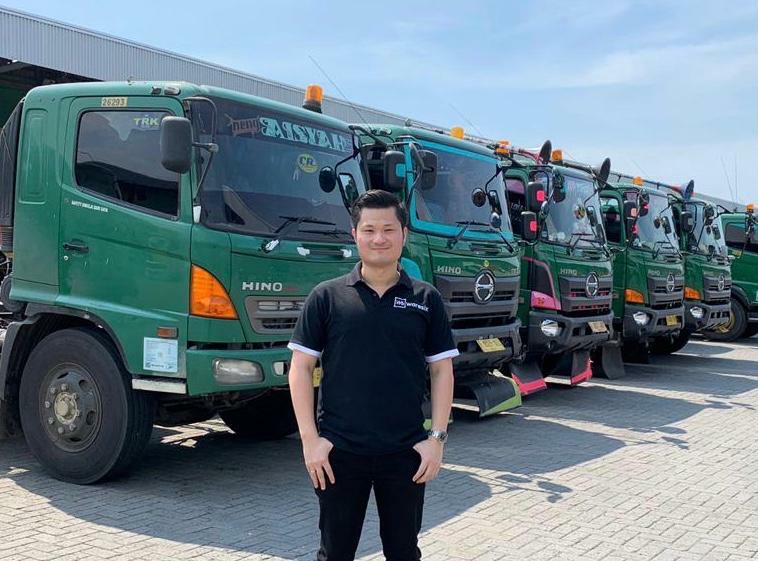 Founded by engineers Andree Susanto, Edwin, and Filbert Hansel in 2017, Waresix uses multimodal transport and are the only player in the industry to provide an end-to-end freight solution to address the unruly landscape of Indonesia’s archipelago. Waresix currently handles over 100,000 metric tons equivalent of monthly transactions and is growing by 25% month on month. About 100 businesses – including enterprises and medium-sized companies – use the platform to connect with logistics services that have local knowledge and expertise in the areas they are in, which gives customers confidence and assurance that their choice is the right one. Customers also have flexibility in their freight movements, making distribution more efficient when they utilise Waresix’s warehouses for consolidation or deconsolidation. They can also leverage on the available truck fleets on the ecosystem. Waresix plans to continue growing and empowering their clients to take better control of their supply chain with transparency, efficiency, and agility to grow their bottom line. Waresix is a logistics tech startup that focuses on providing businesses with end-to-end storage solutions that include transportation and warehousing. Founded in 2017 by engineers Andree Susanto, Edwin, and Filbert Hansel, Waresix is a fast-growing company that has over 200 warehouse partners in operation and 100 businesses that use their platform to solve logistical challenges. The company provides a unique solution to businesses looking to overcome Indonesia’s logistical challenges.